The advanced technology of stone carpet system enables the installment of water-permeable, mineral-resin and a jointless surface which is composed of a mixture of high quality polyurethane and coloured quartz aggregate. Applying advanced technology and best quality materials results in a durable surface of an attractive appearance and an excellent performance. This system is often used for pathways in gardens, parks and public space as it improves opportunities for walking and cycling. The stone carpet gives a wide choice of space arrangements The surface is water-permeable and has an attractive appearance. 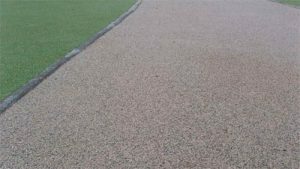 The stone carpet may be applied in all places where it is required to use flexible, durable, weather and UV proof material. Our product shows very good mechanical and physical properties – even light weight vehicles traffic is permitted. It is easy to clean and maintain. 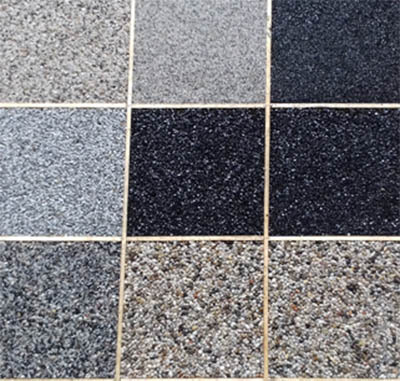 The stone carpet is regarded as an alternative to paving blocks. It doesn’t need a concrete screed framework – it can be applied in fast and easy way. 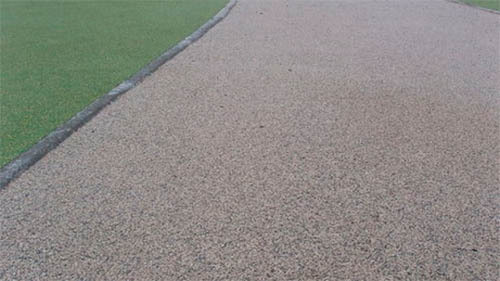 A special composition of resin and selected, high quality aggregates enables to achieve a porous texture which gives enough space for air and water circulation – as a result no puddles form on the surface. The stone carpet incorporates a rough and comfortable, non slippery surface. It is very convenient solution for parking lots, as well as for pathways in gardens, parks and public space. The stone carpet does not require an additional sewage system. It is environmentally friendly. Water penetrating the surface does not damage it’s structure even if the temperature drops below 0 °C. In addition, unlike the paving blocks, the stone carpet is never overgrown with grass of other plants. It can be used in steep areas e.g. to suit the needs of disabled people. 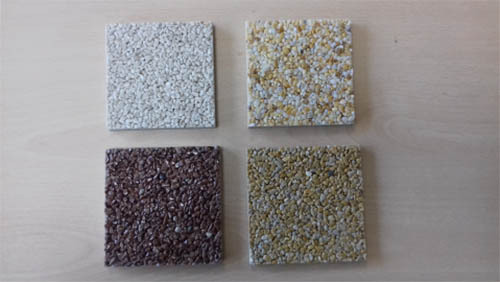 Thickness of the layers depends on the nature of application, load requirements, size and type of aggregates (Warstwa użytkowa – top layer; Podbudowa – substructure; Podłoże – Roadbed). A marble terrace is a jointless stone carpet based on transparent polyurethane and colourful marble aggregates. The system is intended for installation on terraces and balconies. It is especially suitable where the combination of good appearance and excellent weather resistance is required. For safe drainage of rainwater the appropriate degree of surface incline must be assured.